(PASADENA, CA) The Saints stretched their win streak to two games this past Wednesday night with an impressive performance over the SoCal Catch at Biola University. The bats continued to perform amounting to 13 runs, three of which were home runs for the Saints, compared to five for the Catch. Although the game resulted being called in the ninth inning, due to lighting issues, the Saints had an excellent performance across the lineup offensively. Taylor Floyd (Grayson College) started the game for the Saints, striking out two in the first, and allowing one run. The top of the second inning consisted of a Blake Burton (University of Washington) solo home run, a feat that he has accomplished two games in a row. Dustin Krob (Dayton) brought in an additional two runs off a double to deep left, bringing home Derek Gibree (St. Leo’s University) and Mitch Kerner (Emory University). The Saints led at the top of the second 3-1. A solo shot by Jimmy Jeffries (Catcher), for the Catch, made the contest 3-2, a half inning before the Saints began their offensive frenzy. To start the inning, Gabriel Chavez (Calif. State University, San Bernardino) executed a lead-off double for the Saints which would pave the way for the remainder of the inning. Chavez would steal third, Spencer Mossburg (Lee University) walks to first. With two runners on early in the second, Burton delivers a three-run home run to right field, making the score 6-2. After Gibree was hit by the pitcher, this advanced him to first and started a domino effect of base running in efforts by Josh Magee (Faulkner University) and Dustin Krob, who brought in three more runs for the Saints. This made the score 9-2 Saints, with zero outs still on the scoreboard. On his personal success: “I’m Getting comfortable up there, with this year at (Washington) not getting much playing time, to see some live pitching and getting in the same routine and rhythm here helps me trust my swing a bit more” Burton now has three home runs on the season for the Saints. After a Bryan Smith (Occidental College) strikeout to record the first out of the inning, Gabe Chavez hits yet another double to get runners on first and third for the Saints. Mossburg, up at the plate, hits the second home run of the inning, bringing home three runs for Saints. The Saints produced nine runs in the top of the third, making the score 12-2. Floyd pitched one more inning for the Saints, giving up a run on a passed ball. 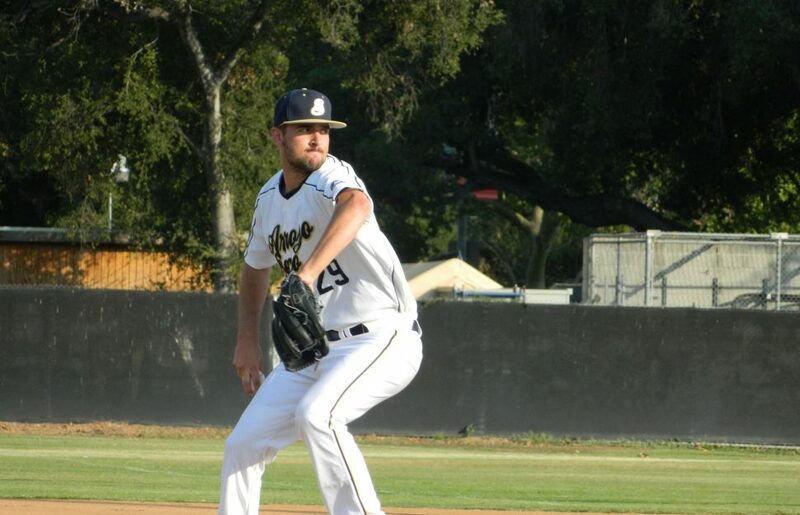 Corbin Lamb (Lee University) would relieve Floyd and pitch four innings where he would only allow one run in that time frame. The Saints would score one more run on a Sac single by Mossburg. The game was stopped by the umpire at the top of the ninth due to lighting; the game will resume on 06/29, next time the two teams meet at Brookside Park. The Next game for the Saints will be Thursday, June 15 against the Long Beach Legends at home.